Happy Monday, October 1st, and the first day of Breast Cancer Awareness Month! We are so excited to share what we have been up to these last few months, as we have been travelling and re-connecting with our Pink Cart partners across the country. Many of them in communities near you! As I blogged about in August, The Pink Cart Team decided to celebrate our upcoming ten year anniversary by visiting folks that have taken our little Pink Cart idea and built on it in their own community, and the results are astounding. Honestly, it has been an emotional roller coaster for me as I have interviewed half a dozen people that fully embraced Pink Cart for deeply personal reasons. Don’t we all have deeply personal reasons? Isn’t THAT why we fight the fight? That’s why I do it, for my Mom, my sister, my community of women friends. Who do you think of in October - the month we have chosen to bring heightened awareness to breast cancer? The weird thing is that for those of us touched, every month is October, but I am thankful for the added conversation and especially seeing pink everywhere. From football fields, to pink gloves on awesome nurses dancing, to Pink’s "Raise Your Glass" music video on YouTube... everywhere you look, you see pink. Rock on October! Part of our work while visiitng our Pink Cart partners was to catalog our chats, so we could bring these stories to all of you! 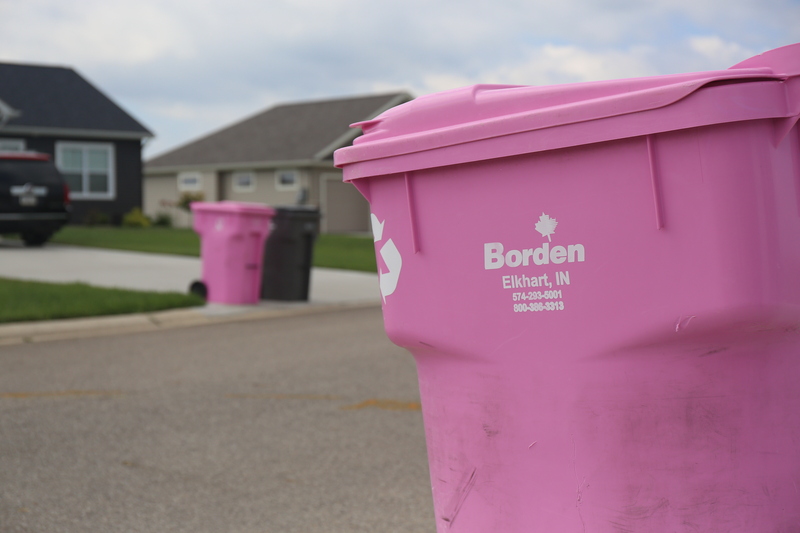 This Monday's video interview is with Ken Himes, the owner and President of Borden Waste-Away in beautiful Elkhart, Indiana. Ken was an early adopter of The Pink Cart nine years ago and not only has he raised money for the American Cancer Society, but chose their local Goshen Center for Cancer Care to donate additional money - raised in concert with his fantastic residential customers who have opted for a Pink Cart at their curb. Ken's company is responsible for contributing over $200,000 to Goshen! That kind of money really does make a difference. Enjoy meeting Ken and please come back next Monday to meet Mayor David Mayer (yes, not a typo - Mayor Mayer!) of Gloucester Township, New Jersey - who’s town made the single largest purchase of Pink Carts yet. Now let’s kick that cancer to the curb!